All necessary comforts close to Baden-Baden, but in a very quiet area. 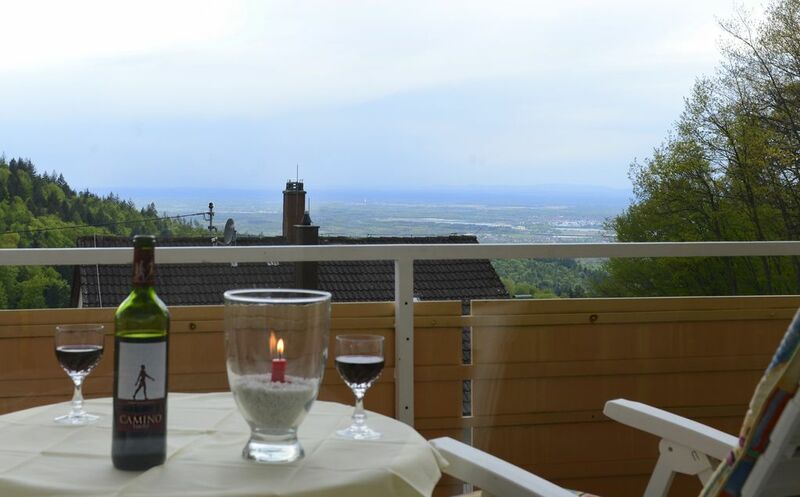 The apartment is very comfortable, with a splendid balcony view out over the Rhein valley and across to France. It’s the perfect size for one or two people. Walking distance to two castles (2 minutes and 30 minutes by foot) and 10 minutes by car to the central area of Baden-Baden. The only negative is a personal one—if you are taller than 5’10” (175cm) you run the risk of hitting your head on the living room light fixture. The upside is that I got a good laugh every time I hit it. thank you so much for your friendly and humorous valuation of your stay in our "Ferienidyll". Thank you so much for the "five stars"!!! We have had a superb communication right from the beginning of your booking in January and while you were staying in Germany, you are lovely people. Thank you for pointing out the sights which are nearby. Sorry for the lamp in the living-room. We will look to this problem and pin it up higher! All the best to you and a safe journey back home to the USA. I cannot say that the apartment was unclean. The location was good. What the apartment needed was to be updated. Everything was very old. The oven, toaster, the cupboards, crockery and furniture. The apartment is clearly rented out a lot and as such it would be good to give it a fresh clean look. To be asked to pay 2 euros to use the washing machine is the first time I have experienced such. I would prefer the apartment rental included this so as not to make the owner look so penny pinching. 2 euros is nothing but it is the principle. We made a point of staying away from the apartment as much as possible as we did not feel it was the kind of place to sit and relax and enjoy the facilities. Not much information offered in English other than what you need to pay for the washing machine. Baden Baden seems to be an excuse for you to accept whatever you get. Not for this family in the future. Location is a 3-4 minute drive from Baden-Baden's centre. Room was better than I expected. Nice views and quiet neighbourhood. Helpful owner, and stocked coffee cabinet! :) Perfect, thanks! thank you so much for your valuation. Come back again, you were nice guests! Loved Living Here! Will definitely return. This is a great apartment. Felt like being home. The apartment was equipped with everything we needed. I was so happy to find the apartment so clean . The view is spectacular. The walking trails are wonderful. You must have a car for this location although Baden Baden is 3 km. away. I will surely return in the future without hesitation. The neighbours are pleasant. Great location for travelling to other parts of the Black Forest and the French Alsass. ganz herzlichen Dank für eure fabelhafte Bewertung. Ja, der Kontakt zu euch war von Anfang an sehr harmonisch, ich erinnere mich an die freundlichen Telefonate von und nach Kanada. Ihr seid sehr sympatische Menschen und wir freuen uns, dass ihr eine schöne Zeit hattet, mit der Wohnung zufrieden wart und den Aufenthalt für Besuche in den umliegenden Thermalbädern genutzt habt. This was as it described an ideal location for exploring Baden Baden, and the very attractive surrounding countryside. So mich so that there was very much more we could have done with more time. The appartment was very pleasantly arranged, and it was good to have a welcoming telephone call from Frau Theilike who made us clear that she was happy to be contacted if we needed any help. As it was there was lots of helpful information in the appartment which answered most of our questions. Ebersteinberg is a lovely quiet village wit a good bakery, shop and a very good pizzaria, and it is very quick to get into Baden Baden by car. Frieburg was just about an hour's drive away and was well worth seeing. The Caracalla spa was such a good experience it had to be repeated! We shall miss it until we get to return which I hope will not be too long. thank you so much for your valuation and your kind words. We had a good contact via internet and telephone and I took an immediate liking to you and your familiy. I am happy to hear that you had a good time, enjoyed your stay in the Caracalla Spa in Baden-Baden and your trip to Freiburg. The description was correct. The apartment was clean. The contact to the landlord was very easy. I will recommend this apartment to my friends. Good restaurants are close by or in a short driving distance. Hiking possibilities are very near by. herzlichen Dank für Ihre fabelhafte Bewertung! Besonders freue ich mich über die fünf Sterne! Sie waren ausgesprochen sympathische, unkomplizierte und sehr verantwortungsvolle Gäste. Während Ihres fünfwöchigen Aufenthalts haben Sie sich so sorgfältig um die Wohnung gekümmert, als wäre es Ihr Eigentum. Danke dafür! Ihnen weiterhin alles, alles Gute, Gesundheit und Wohlergehen. Kommen Sie wieder gut in Kalifornien an. Die Stadt Baden-Baden erhebt pro Nacht pro erwachsener Person eine Kurtaxe von 2,00 €. There is a tax of 2,00€ per adult/ per night. Ab 4 Wochen ist die Absprache eines Pauschalpreises möglich. A special price is possible for a stay of more than 4 weeks. Bis zu 3 Nächten kostet die 3. Person 10,00 € pro Nacht extra. Up to 3 nights the third person costs 10,00 € extra per night. Den Gästen steht ein Carport unentgeldlich zur Verfügung. There is a carport for the guests, free of charge. There is W-Lan, free of charge.